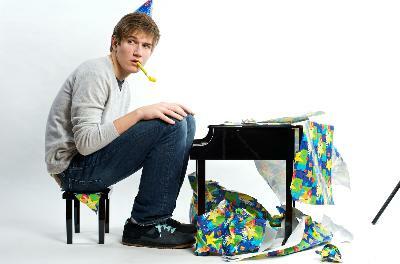 The Student Activities Board (SAB) will present comedian Bo Burnham at 8 p.m. Nov. 7 in Baldwin Hall Auditorium. Tickets are free with a Truman student ID and can be picked up at the SAB Office in the Student Union Building. General admission tickets are $10 and can be purchased online at http://sab.truman.edu/store or at the SAB Office. Three years ago, Burnham was just another high school student recording YouTube videos for fun. Today, he has burst onto the comedy scene with a full-length album, a Comedy Central special and a deal to write a film for Judd Apatow. In March, Burnham released his first full-length album “Bo Burnham” which topped Billboard’s New Artist chart and was No. 2 on Billboard’s Comedy chart in its first week. Four days after his 18th birthday, Burnham became the youngest person to record a “Comedy Central Presents” special, which premiered in March 2009. During the fall of his junior year in high school, Burnham started teaching himself how to play piano and guitar. Soon after, he wrote and composed autobiographical songs, such as “My Whole Family Thinks I’m Gay,” as non-fictional jokes between him and his friends. In 2006, Burnham recorded two of his songs as videos and posted them on YouTube. Three years and 15 videos later, his videos have been seen more than 50 million times worldwide. The songs, recorded in Burnham’s bedroom with a camera resting on a stack of books, have been remixed, rated and reviewed thousands of times. With the growing Internet buzz, Burnham was invited to the “Just for Laughs Comedy Festival” in Montreal in 2007 where he met Apatow, who flipped for the, then 17-year-old. Shortly after, Burnham signed a deal to write the script and songs for an “anti-high school musical” feature in which he would also star, with Apatow producing. In 2008, Burnham signed a four-record deal with Comedy Central Records. He released his first digital-only album “Bo Fo Sho” on iTunes in June. The album hit No. 1 on the iTunes comedy album chart and No. 6 on the overall iTunes album chart. Truman GlobeMed is looking to the future with its “Imagine 2030” campaign, and the group is asking for help to win $50,000. GlobeMed is a student-led network that strives to help local health organizations working with communities around the world. “Imagine 2030” is an initiative of 20 GlobeMed chapters at universities across the country. Chapter members have been making YouTube videos discussing what they think global health will be like in 2030. As part of the “Imagine 2030” campaign, GlobeMed is soliciting $10-donations online through a Facebook challenge. Each donation counts as a vote, and the chapter with the most votes by Nov. 6 will win $50,000. Money raised during the “Imagine 2030” campaign goes toward helping grassroots health organizations to establish a sustainable, community-based network to provide a better quality of life to people in impoverished regions all over the world. For more information about donating, go online to http://www.imagine2030.org/donate. To see “Imagine 2030” videos, go to http://www.youtube.com/watch?v=HZkPliLrFZU. Truman students who traveled to Cape Town, South Africa last summer to participate in the Study Abroad program, “Democracy and Human Rights in South Africa,” will share their experiences at 7 p.m. Nov. 3 in the Student Union Building Georgian Room C.
Twelve students from Truman traveled to Cape Town from May 14-June 5. The trip gave them an opportunity to live and work in one of most beautiful cities in the world while studying the multiple concerns facing South Africa as it strives to become a progressive democracy. Students and faculty at Sivunyile National Baptist Church in Guguletu township. From left: Elaine McDuff, Artesia Willis, Breanne Palmer, Kathrine Olsen Flaate, Cameron Poole (back), Austin Roberts (front), Adam Conway, Megan Turnure, Clint Mohs, Erin Erhardt, Colette Linton, Krista Goodman and Abigail Helmick. The heart of the program was an internship opportunity that directly involved students with institutions that are wrestling with South Africa’s troubled past and helping create a modern, democratic civil society. Each student worked for 10 days with a non-governmental agency whose mission is to address issues of social injustice and their continuing impact on formerly disenfranchised South Africans, especially women, children, immigrants and AIDS victims. The other days were spent visiting museums and historical sites and hearing lectures on contemporary political and economic issues in South Africa. The public is welcome to attend the presentation and refreshments will be served. Any Truman students interested in working with animals should consider an internship at the Kindness Ranch. An informational meeting will take place at 5 p.m. Nov. 5 in Barnett Hall 2224. Kindness Ranch, located in Hartville, Wyo., is a sanctuary for research animals. A vast majority of the animals at Kindness Ranch come from private laboratories or university research facilities. As of November, the ranch is caring for approximately 65 animals, including cats, dogs, sheep, pigs and horses. Kindness Ranch opened in 2007 after its founder, Dr. David Groobman, saved for 10 years to purchase the 1,000 acres that make up the ranch and to build the facilities for the animals and guests. Karen Straight, who serves as co-director of the Kindness Ranch with her partner Matt Farwell, met faculty in the Department of Society and Environment when the couple lived in Kirksville from 2006-2008. When they decided to take jobs at the ranch, Straight approached the faculty about establishing an internship through the University. 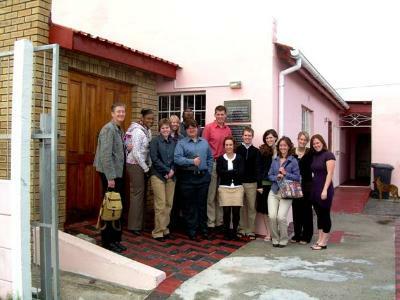 In December 2008, the first four interns went to work at Kindness Ranch. While the internship originated in the Department of Society and Environment with the collaborative efforts of sociology, anthropology and agricultural science faculty members, it is open all majors. Applications for internships at Kindness Ranch are available online at http://societyandenvironment.truman.edu/ on the “Internships” tab. They are also available by request from Amber Johnson, chair of the Department of Society and Environment, at ajohnson@truman.edu and Michael Seipel, chair of the Department of Agriculture Science, at mseipel@truman.edu. Animals at Kindness Ranch are profiled on the organization’s website, and supporters can follow their progress, inquire about adoptions and make donations at http://kindnessranch.org. Kindness Ranch is supported entirely by donations. The next Faculty Forum will take place at 6:30 p.m. Nov. 2 in Magruder Hall 1000 and will feature Christine Harker, associate professor of English, on "17th Century Poetic Crossdressing: Mairi NicLeod and the Bardic Masculine." In sabbatical-supported research, Harker studied the work of the 17th century Scots Gaelic poet Màiri nighean Alasdair Ruaidh (Mary MacLeod, c. 1615–c. 1705). Notable as a largely self-trained woman in a world dominated by career courtly poets, an exclusively male occupation, Màiri served the aristocratic chiefs of Scotland’s Clan MacLeod. Not widely known to modern scholarship outside Celtic Studies, her poetic output is noteworthy not only for her unusual personal circumstances but also for her remarkable ability to write in the high-literary style of the exclusively male bards. In this presentation for a non-specialist audience, Harker will examine the subjects of both the collapse of late-medieval/early-modern Celtic culture as illustrated by the last moments of the traditional high literary traditions of the Gaelic Scottish Highlands—and also the role of a woman occupying a traditionally-male dominated place in that traditional society. The Truman Faculty Forum presentation will involve brief historic overviews of the status of Gaelic culture at the moment when England was eradicating a politically independent Gaeldom and English was rapidly dominating spheres in which high-culture Gaelic had flourished, as well as a brief introduction to the Gaelic bard tradition. It will also address the place of women in this traditional society in order to consider the degree to which Màiri’s work was so remarkable. Some poems will be read in Gaelic and then translated and explicated in English. The Truman Faculty Forum was created in 2003 to give faculty the opportunity to present their research and creative work to the Truman community and to enhance the importance of scholarship and creativity in the culture of the University. Donna Rhinesmith, professor of education, and Sara Orel, professor of art history, will present at Faculty Forum events in the spring. The Truman Public Relations Office is now accepting résumés for the full-time spring 2010 internship position. Interns can receive course credit, a stipend and valuable experience in public relations office duties. Interns usually take six hours of class in addition to taking six hours of internship credit. To apply, send a résumé, two writing samples and contact information for two on-campus references to the Public Relations Office, McClain Hall 101. For specific questions about the internship, contact Heidi Templeton at heidi@truman.edu. In the third competition of the season, members of the Truman Forensics Union traveled to Creighton University in Omaha, Neb., and took second place in debate sweepstakes and fourth in overall team sweepstakes. The team competed against numerous nationally competitive teams, including last year’s national champions in both individual events and debate, Western Kentucky University. In open parliamentary debate, a two-on-two style of off-the-cuff debating, Sophomores Christian Johns and Elizabeth Hatting won their final round against competitors from Rice University. Juniors Sarah Backhaus and Dylan Clark advanced to the quarterfinal elimination round. Johns won a second place speaking award, Backhaus received fourth, Hatting won sixth, and Clark received tenth. In Lincoln-Douglas debate, a one-on-one policy style of debating, Clark advanced to the quarterfinal round of open competition, while Johns advanced to octofinals. Backhaus, while not advancing, did receive an eighth place speaking award in this event. Not only did the varsity debaters do quite well, Truman was also able to debut new debate talent. In Novice Lincoln-Douglas, freshman Alex Clippinger advanced to the final round, taking second place. Freshman Susan Taylor made it into semi-finals, while freshman Katie Koenig advanced to quarterfinals. Clippinger also took a second place speaking award and Koenig a fifth place speaking award. In individual events, there were two tournaments taking place on the same weekend. In the first tournament, freshman Jessica Petrie placed third in Impromptu Speaking and third in Extemporaneous Speaking. Sophomore Andrew Grojean placed fifth in both After Dinner Speaking and Prose Interpretation. Freshman Samantha Jones took sixth in Prose Interpretation, earning her another qualification for the National Championship Tournament at the end of the season. This year, that national championship will take place in Athens, Ohio, and will only include competitors that have proven themselves by advancing to finals at a large tournament. Students have to qualify each event that they have in order to participate in that event at Nationals. The second individual events tournament saw freshman Kyle LaVelle receive sixth in Impromptu Speaking, which earned him a qualification for nationals. Petrie topped her Extemporaneous award from the day prior, receiving second place. This brings the team’s total qualification for nationals up to 13, with more than half the competitive season still remaining. November will find the individual events’ competitors facing one of their toughest challenges of the season, the Bradley University tournament. The team travels to Peoria, Ill., the first weekend in November. The same weekend that the Individual Events team travels to Bradley, the Junior Varsity debaters will travel to Central Missouri University to compete in Lincoln-Douglas, while the Varsity Lincoln-Douglas squad will participate in the Westminster Debate Society’s commemoration of Winston Churchill in Fulton, Mo., at the Winston Churchill Museum. National Collegiate Honors Council has announced a new fellowship for undergraduate honors students. The award is named for Dr. John and Mrs. Edythe Portz, pioneers in honors education whose support of imaginative ventures in undergraduate education has benefited college students in Maryland and throughout the nation since the late 1960s. The highly competitive award of up to $7,000 is open to all students at any of the more than 800 member institutions of the NCHC in the U.S. and beyond. The Portz Fellowships support original and extended interdisciplinary projects for up to 18 months. Applications for the first round of grants will be accepted beginning in January 2010. For more information about the Portz Fellowship, contact Dr. Patrice Berger at pberger1@unl.edu, or 402.472.5425. Applications and information about the Portz Fellowship are available online at http://www.nchchonors.org. The Center for Student Involvement (CSI) welcomes all faculty and staff to nominate student leaders on campus for the Golden Leadership Award (GLA) for the month of November. This award recognizes the hard work, leadership skills and dedication of Truman student leaders. The Golden Leadership Award is based upon four categories of leadership: leadership and work experience, campus involvement, academic achievement and community involvement. The award strives to honor student leaders through a nomination, application and selection process. The nomination form can be picked up in the CSI or completed online at http://csi.truman.edu. The nomination deadline is 5 p.m. Nov. 11. The CSI is located on the first floor of the Student Union Building. Awards will be presented at the Leadership Recognition Program Banquet April 14, 2010. All of the nominees, nominators and Golden Leadership Award recipients will be invited to the banquet. The CSI hopes advisers will recognize Truman students and organizations for their dedication to the campus by nominating them for a GLA. Please direct questions and concerns to Amanda Rhodes in the CSI. Call 660.785.4222, or e-mail her at csilead@truman.edu. Sponsored by University Counseling Services and the Student Public Health Association. We will be there no matter the weather! Wear your pajamas, and come take a short nap in the Student Union Building in the afternoon. Look for our tables on the Quad and in the Student Union Building throughout the week. For helpful sleep tips go to http://sleep.truman.edu/. Tickets are $5 with a Truman student ID, $15 for general admission and can be purchased in the SAB Office or online at http://sab.truman.edu/store. No photography, backpacks, and outside food or drink allowed. All purses and handbags subject to search. June Phillips, a nationally known expert in foreign language teaching, will give a presentation at 8 p.m. Nov. 4 in Georgian Room C in the Student Union Building. Sponsored by the Department of Classical and Modern Languages. Nov. 9 • 2-3 p.m.
Nov. 13 • 1-2 p.m. The workshops will begin in the Conference Room on the upper level of the Student Union Building. The workshops are open to all students, faculty, staff and visitors. To register, visit http://sub.truman.edu/register/classlist.asp. Send questions to Scott Casey, SUB technology manager, at stc3331@truman.edu. In addition to accepting paper requests for the Spring 2010 semester, the Student Union will also accept reservations online at http://emspro.truman.edu beginning Nov. 2 and ending Nov. 5 at 5 p.m. Anything received after Nov. 5 will be processed on a first-come, first-served basis. Students attending will learn about a variety of careers pursued by Truman graduates with a bachelor’s degree in psychology and have an opportunity to ask questions in a one-on-one format and learn about Career Center services and resources specifically for psychology majors. Did you know that both the American Psychological Association (APA) style for writing bibliographic citations and the Modern Language Association (MLA) style changed this year? Here is a link that will help you update your bibliographic citation styles. All are available free on the web. Janice Grow-Maienza, professor of education, and Hyun Joo Kim, associate professor of mathematics, discussed their paper co-authored with Scott Alberts, associate professor of mathematics, at the 43rd national meeting of the Korean Society for Mathematical Education at Hannam University in Daejeon, Korea, Oct. 17. Their paper, titled “Korean Mathematics Adds Value to Teachers’ Conceptual Understanding in the United States,” was published in the September 2009 issue of the society’s journal “Research in Mathematical Education,” Volume 13, Number 3. Janice Grow-Maienza’s invited paper, “Korean Mathematics: In-depth and Focused on the Underlying Concepts,” was published in the October 2009 issue of St. Louis Confluence, journal of the Mathematics Educators of Greater St. Louis (MEGSL). Grow-Maienza will deliver an invited presentation on Korean Mathematics at the annual meeting of MEGSL in St. Louis Nov. 14. The Weekly Lunch Series will continue at 12:30 p.m. Nov. 4 in the Student Union Building Spanish Room with, “Faces of Truman: Joshua Lobert, faculty development intern.” Find out what role Lobert is playing on campus through his grant-funded internship. A Physics Colloquium featuring Student Summer Research Presentations will take place at 4:30 p.m. Nov. 4 in Violette Hall 1000. The following physics majors will present research: Nicholas Wilsey, “Tracing star formation into the extreme outer disks of dwarf irregular galaxies”; Isaac Angert, “Laser Frequency Stabilization at LIGO”; Tom Hogan, “Improvement of Pillar Fabrication for Nanocoaxial Devices”; Kevin Schoelz, “Sublimation of Colloidal Crystals.” For more information about the colloquium series and upcoming talks, visit http://physics.truman.edu/colloquia/mainstage.asp. The American Association of University Professors (AAUP) will meet at 4:30 p.m. Nov. 6 at the University Club House, located at 516 E. Patterson. Contact Marc Becker at marc@truman.edu or call 785.6036 for more information. The Maraca 2 Percussion Duo from Great Britain will be in concert at 8 p.m. Nov. 6 in Ophelia Parrish Performance Hall. Hailed for their tremendous technical and musical artistry throughout Europe and Japan, the Maraca 2 ensemble is currently on their debut U.S. tour. As part of their residency to Truman, the duo will also be present master classes and guest lecture presentations on contemporary music in the UK. Their appearance is co-sponsored by the Department of Music Visiting Artist Series, School of Arts and Letters, Center for Multi-Cultural Affairs, Phi Mu Alpha Sinfonia and Sigma Alpha Iota. Admission is Free. For additional information, contact Michael Bump, percussion studies, at 785.4052 or mbump@truman.edu. The University Orchestra will present a concert at 8 p.m. Nov. 7 in Ophelia Parrish Performance Hall. The performance will feature music by Mendelssohn, Elgar, Debussy and Berlioz. Guest soloist will be Jesse Krebs on clarinet. Admission to the concert is free. GlobeMed will present “From Hometown to Haiti: A Step Towards Sustainability,” featuring quest speaker Evan Lyon, graduate of Harvard Medical School and clinician at Partners in Health, at 6 p.m. Nov. 14 in the Student Union Building 3200. All proceeds go to Maison de Naissance, a birthing home in Haiti. Tickets are $20 per person. Contact truman@globemed.org if you would like to attend. The latest edition of the McNair Program newsletter is available in a PDF format at http://trumantoday.truman.edu/pdf/McNairNewsletter.pdf. The Career Center is hiring for the spring semester. If you are a scholarship or work study student, consider applying for the In-Center or Public Relations teams. Directions and applications are on https://trupositions.truman.edu/jobs.asp. There is a required preview session Nov. 16 in the Career Center from 6-7 p.m. and required training Jan. 10 from 1-6 p.m. in the Career Center. In addition to applying on Trupositions and attending the preview session, students should turn in materials to the Career Center by 5 p.m. Nov. 20.